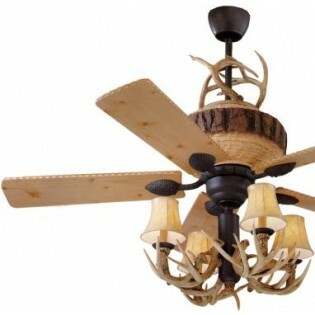 Enjoy the rustic appeal of antler and wood with this very rustic Antler Ceiling Fan. Enjoy the rustic appeal of antler and wood with this Faux Antler Ceiling Fan. 52" Ceiling Fan with a heavy duty 3 speed reversible motor, 16 degree blade pitch for optimum air movement also features weathered iron finish and lodge pine blades, faux antler light kit and scroll kit are included.